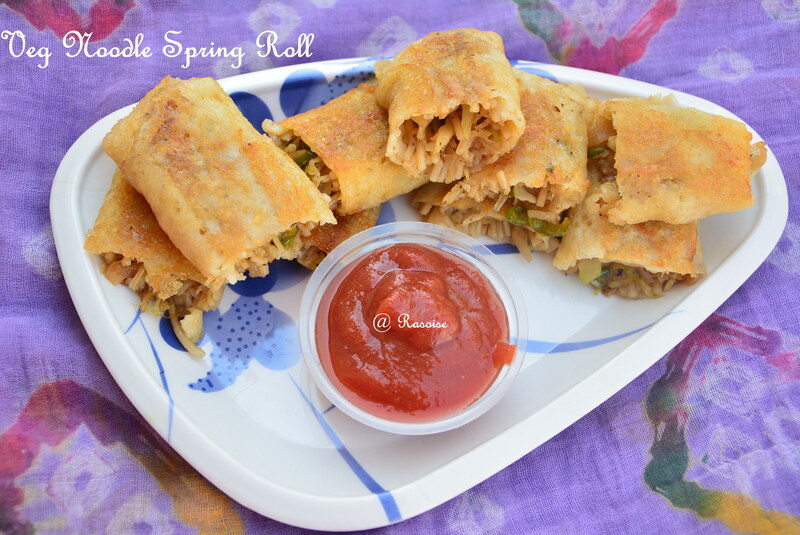 Spring Roll is an indo – Chinese recipe. 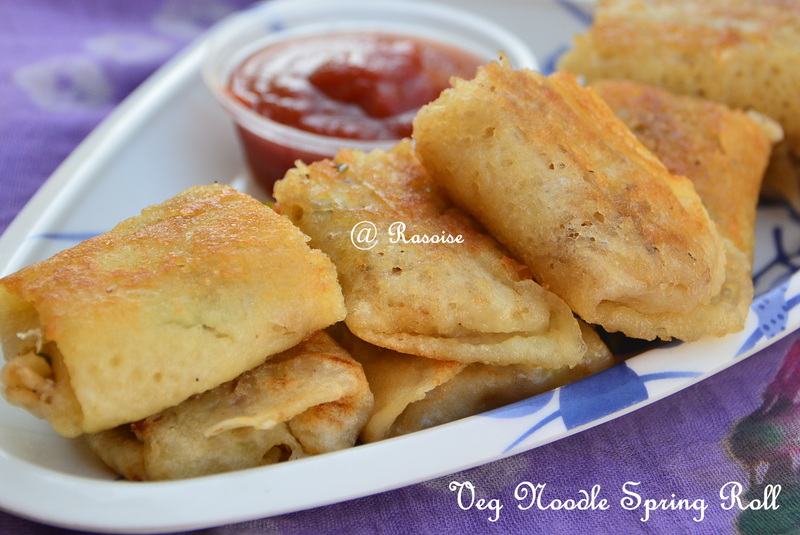 It is crunchy mix vegetables and noodles rolled and deep fried in in all purpose flour wrappers. It crispy, crunchy, spicy snack wich can be served with Chinese sauces or simple tomato sauce. The wrappers used in spring roll are available in leading departmental stores. However I have made wrappers at home. Instead of deep frying the rolls, I have shallow fried. You can use any veggies of your choice. You may also like, Manchurian and Fried rice. In a big bowl combine the plain flour, water and salt, and whisk well until well combined and there are no lumps. The batter should be of flowing consistency. Heat and grease a nonstick pan with oil. Once the pan is hot, with heat on medium, pour a ladle of the batter into the pan spread around quickly(like we do for dosa) to make a thin circle. Cook on medium heat until you see the sides are peeling. When the sides begin to peel off, turn the wrapper and cook on the other side for a few seconds. Repeat with the remaining batter to make more wrappers. Heat a tablespoon of oil in a wok on high heat. Add in the cabbage, carrots, onions, capsicum.. Saute the vegetables on high heat. Do not overcook, the veggies should be crunchy. Stir in the salt and black pepper. Add sauces and noodles. Saute for a minute and transfer to a another bowl. Allow the mixture to cool completely. Fold in from the filled corner and begin rolling until you reach the center. When you reach the center, fold the ends arising from the sides of the wrapper. And roll till the end.Make sure the edges are sealed well. The flour paste is important as it helps to seal the spring rolls so they don’t open up when deep fried. Repeat the process and make the rest of the spring rolls. Heat the oil in a heavy bottom wok and add in a few rolls at a time and deep fry on medium heat until golden brown in color. Serve the spring rolls with homemade tomato sauce. Milk and milk products are very important part of our diet. Paneer is a fresh cheese, also known as chenna is made curdling heated milk with lemon juice, vinegar, or any other food acids. Moist and soft crumbly in texture, it is used to make delicacies such as Sandesh, Mutter paneer and Rasgulla. It is a rich source of milk protein. Paneer is the rich source of calcium, phosphorus, vitamins, minerals and protein which are required by the body in high proportions for healthy growth and development. Since paneer is a high protein food having high level of calcium and phosphorus it helps in building strong bones and teeth. Paneer is high protein diet having monounsaturated and polyunsaturated fat which helps in lowering and managing the body weight. My mom used to say paneer is essential in kid’s diet. It provides better nourishment to the growing age children. It boosts the immune system and thus prevents the risk of various diseases in children like cough, cold, bronchial asthma and etc. Its availability of good level of vitamins, minerals, calcium and phosphorus provides better and healthy nutrients for growth of bones and brain. Its high value of B group vitamins, high protein level, omega-3 fatty acids and antioxidants helps hair and skin gets healthy, glowing and rejuvenate. 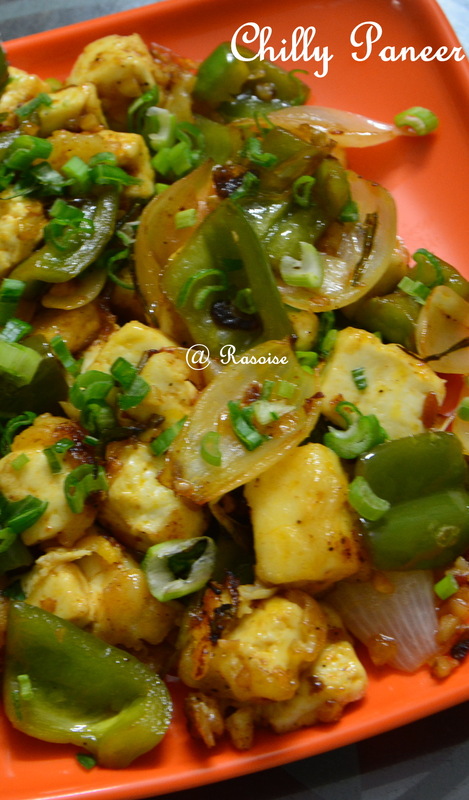 Chilli Paneer is an Indo Chinese recipe. This recipe is frequently made in my kitchen. Paneer is deep fried in a batter of maida and corn flour. Here, I have shallow fried paneer dusted with corn flour. As the name suggests it also contains capsicum as another main ingredient. This recipe is so easy to make and it’s not time consuming. If you have sauces ready you are done. Dust the paneer cubes with corn flour. Shallow fry the paneer cubes for two minutes. Heat oil in a pan. Add garlic and green chillies. Saute for a while and add cubed onions. Saute till little brown in color. Add capsicum pieces and sauté on high flame for approx two minutes. Capsicum pieces should be tender and not soft. Reduce the flame and add all the sauces and salt. Add black pepper. Add fried paneer cubes. Saute till the mixture blends uniformly. Close the flame. Drizzle lemon juice and garnish with spring onion green. 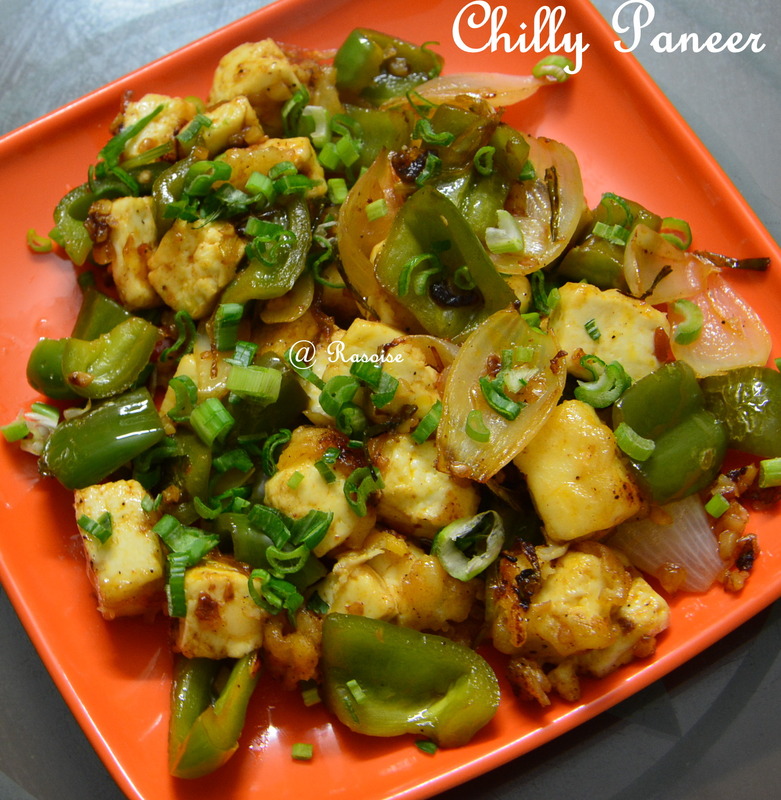 Chilli Paneer can be served as starter or as evening snack.